The upside of a down year for Vanier Cup attendance is that Hamilton will be host for the 2017 title game, so they have a chance to figure out why so many of those seats are unoccupied. Forget about how great a game Laval and Calgary engaged in; it is alarming that there was such a step backwards, with the lowest attendance in the event's history. Attendance as never announced, but there was no way that the glutei-in-seats count matched the record-low of 8,184 from 1997. It was not just the luck of the draw that is having a Calgary-Laval matchup in a championship game in Southern Ontario. It's also not that people in Canada don't care about football; the size of crowds at conference championship games and rivalry games such as the Panda Game refute such defeatism. On Twitter, #Vanier52 was trending more strongly than Michigan and Ohio State in Canada. With a nearly wholesale change in leadership at U Sports Canada and seemingly little collaboration between the organizers and Hamilton Tiger-Cats, the attendance is not surprising. The glass-half-full take on stadium-nearly-empty is that everyone probably realizes more work could have been done. Whether there will be action remains to be seen. And hey, what should be the most important day in the university sports calendar, especially so with the rebranding, is at least going to get some much needed support from the Ontario government in 2017 (a $100,000 tourism grant to help with having some, any, promotional ramp-up throughout the season). That said, there are takeaways from this experience worth putting down for dozens of readers. Believe you me, this post has been revised once on screen and about a dozen times mentally, since I do not even know what to think any more. It is probably time to look at finding a long-term home base for the game again. 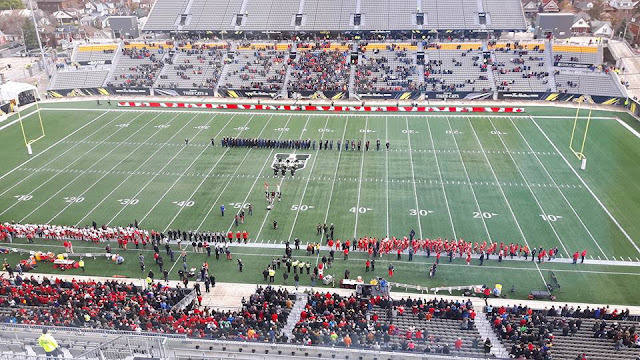 For a number of reasons, U Sports should probably look at Ottawa and TD Place. Ottawa is a tourist destination with easy driving distance of almost every school in OUA and the RSEQ. It also has, as a bilingual government town a sizable alumni base for almost any participating school. That can count for a lot if alumni chapters can be called upon to get out the word (harder than you think, because Canada). Presumably, any school that is large enough to support a Vanier contender is going to have an active alumni chapter in the national capital region. Of course, Ottawa also has all the big shiny things: having two universities with Carleton and Ottawa, rather than only McMaster, means there is that much more exposure to university sport. There is a raucous stadium atmosphere with the Redblacks and a stadium that is in an entertainment zone. To be fair, TD Place is still in the new-stadium novelty period. That stadium is not going anywhere. Neither is the retail around it. Or Parliament Hill. It's always dicey to make direct comparisons between university sport in Canada and the indentured-servitude industrial complex down south, but the NCAA's lower divisions provide the best argument for a long-term host. These are leagues which are not on TV every week, but somehow people are aware that they play good football. The Football Championship Subdivision (FCS) championship game has been held in two cities since 1997. The FCS is currently just more than halfway through a 10-year contract to play the game in Frisco, Texas; prior to that, it was Chattanooga, Tenn., for 13 years. Similarly, the Division II championship game is in a four-year run in Kansas City, Kansas, but prior to that it was in held in Florence, Alabama (pop. 39,319) from 1986-2013. The business communities in those cities know there's an event and know it will get repeat customers. U Sports/CIS barely takes its coat off and stays awhile. Since 2004, the Vanier has been in in six different cities (Hamilton, Montreal, Quebec City, Saskatoon, Toronto, Vancouver). To some extent, getting Calgary-Laval was bad luck, but U Sports can create its own luck. Someone had to know that Canada West is 15-1 at home in national semifinals, or something like that. Quebec has lost one semifinal at home during the Laval era (McGill in 2002). Would it have been such a bad idea to put the game in either of those regions? Of course, that assumes someone wants to host it. The good news is that next season the Ontario conference champion heads east to play AUS' best in the Uteck Bowl. There is an excellent chance of a Southern Ontario school being in the game. That said, if Laurier has 30 busloads of students that amounts to 1,500 fans, which is a drop in the bucket in a 24,000-seat stadium. It's fine if U Sports wants to carry on with hoping it lucks out with a local team qualifying for the game, but Graham Brown has said he wants to get away from that. That's ambitious. The only Vanier to draw more than 20,000 fans in the last 15 years without being twinned with the Grey Cup was in Montreal in 2014. About half of the 22,000 tickets were sold after Montreal won the Mitchell Bowl. Laval fans do not travel in the numbers they used to; like Carleton men's basketball, there's just an expectation that they will win. Someone has to say it: Hamilton would do well with a Grey Cup, but the prospect of visiting Hamilton is going to not going to entice one to go to the Vanier Cup. I like the city, but it's not a destination city. It's also not as accessible to fans from, or alumni of, the schools in Quebec and Western Canada. The business model dictates using the larger stadiums, but I'll entertain the notion that maybe the game's appeal has shrunk to the point where there is a case for playing only in campus stadiums. Very few could accommodate more than 10,000 fans. It's hard to see the leadership viewing that positively; they'll probably think it's a step down. The rub there is that Saturday probably was a step down. Okay, there is your hot take. Why not let one participating team host it? I doubt that many people outside Hamilton bought advance tickets to see what was probably a Quebec vs Canada West game. Sorry, Neate, this thing got way too long.